I've teamed up with Courtney's Sweets for this awesome giveaway of a Tree Top Climb & Slide! Mason has been enjoying the playground more and more so I know he would love to have this to play on at grandma's. Good luck! "This fun climber features apple trees on both sides so kids will feel like they are really in the tree tops. Two opposing ladders make it easy to access the platform and slide down the brightly colored wavy slide. Take a break on the sturdy table and bench with backrest conveniently located in the back of the unit. The multipurpose table reverses to become a sand pit. The possibilities are truly endless! 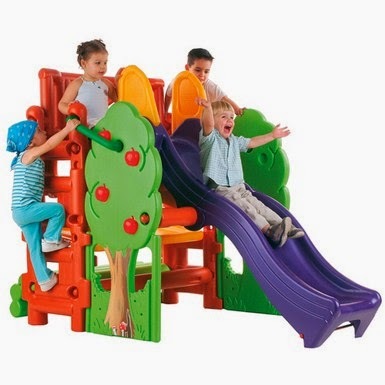 Children will have a blast on the durable Tree Top Climb and Slide for long-lasting indoor or outdoor use." I like the 12 Drawer Mobile Organizer, great for all the little things. I love the Phanty pic n rock!! I would love the Learn Your Colors Paint Crate - 27 Pc. Set. I would love to have the Discovery Cove play center! I also like their 10 drawer mobile organizer because I own one! My daughter stores art supplies in hers and we love it. I also like their 65in kidney resin table. I love the Colorful Essentials Play Kitchen - Washer/Dryer. They have some really neat stuff on their site! We have one of their table and chair sets--love them. Would love to get my daughter a book shelf as well. I like the 3-in-1 Art Easel which has a dry erase board on one side and a chalkboard on the other, plus a tray for paint cups. My two year old grandson's mom is an artist and they can do art together. Another product i like is the 8pc. teacher stamp set. I love the "Gus" Climb-N-Crawl Caterpillar. Hi! I really like their 48 Piece Architectural Blocks with Carry Case. Wooden blocks are the best! It's perfect for my grandson. Thanks! The two-Station Art Easel with Storage is awesome. I would love the 4'x8' Tumbling Mat since dd is taking tumbling now! My children would flip over the Phanty Pic-N-Rock! You don't see too many teeter-totters in playgrounds anymore, so they get so excited when they find one! My kids would love the Puppet Theater - Dry-Erase Board. My kids would LOVE the "Gus" Climb-N-Crawl Caterpillar!! I also like their 12 drawer mobile organizer. Looks so colorful but will keep everything in order.